Ready to start making your summer bucket list? Summer is one of my favorite seasons and I’m all about making the most of summer with my family. We have a pretty good handle on family fun during the summer but this year, I want to create more memories with my husband. So get your pen and paper ready! 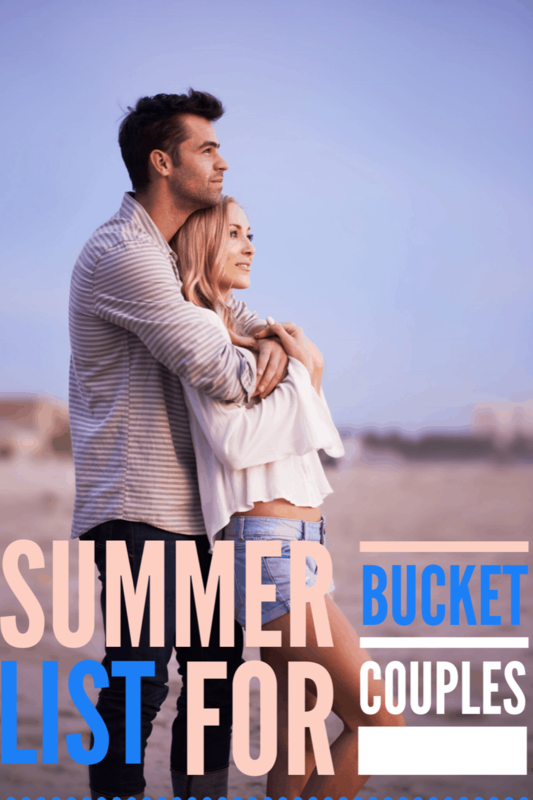 We are going to create a summer bucket list for couples. 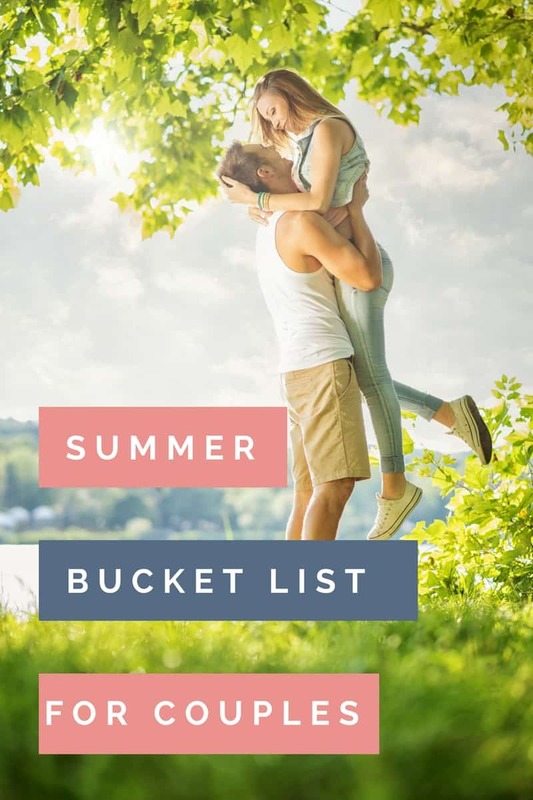 We are going to brainstorm all sorts of fun activities that you can do with your sweetie this summer. You’ve probably been to the amusement park with the kids but this time go without the kids! No crying for expensive treats, no waiting in lines for the kid rides and no trips to the bathroom every 30-minutes. Spend the day with your sweetie, enjoying the rides, sharing a funnel cake and taking cute pictures in the photo booth! Oh and don’t forget to play some over-priced games and win a huge stuffed animal. Yep, that’s right, send the kiddo’s to boarding school, summer camp or more grandma’s (the practical solution). Enjoy a night or weekend with just your spouse. Snuggle on the couch and watch movies, enjoy intimacy in new places in your home and maybe even sleep in a little. I love camping with the family and we try to do it a few times a year. This year, I want to try doing a camping trip with just my hubby. I think it would be so fun to cuddle up with him in a sleeping bag by the fire. Who knows, we might even try skinny dipping in the lake! I don’t know about you but I’m not a morning person! However, getting up super early, before the kids wake up to watch the sunrise is just romantic. Sip on your favorite coffee or tea and enjoy the beauty of the sun while it rises. Where I live, the summer nights are so warm! Try taking a late night swim with your hubby. It will give you the chance to really get in some quality time and probably encourage intimacy. Do something completely out of your comfort zone! Go zip lining, skydiving or anything else that really pushes your boundaries. It will be an awesome bonding experience! If you are lucky enough to have a drive-in near you, I highly suggest you go! My husband and I try to go to the drive-in a few times a year. We always grab some fast food and snacks to munch in the car while watching the movie. Turn on the music and head outside with your sweetie. Spend the evening sipping your favorite drink and dancing under the stars. Look at the different concerts being offered in your area and find one that you’ll both enjoy. Outdoor concerts are so fun to attend with your spouse. You get to enjoy the nice weather, good music, yummy drinks and of course quality time with your spouse. Hiking is a great way to not only get some exercise and create some great memories together. Getting outdoors and taking in some fresh air is good for the soul. Pack your favorite lunch and head out to the prettiest spot you can think of. Make sure to go in the early afternoon to avoid the super hot sun. Sometimes it’s fun to act like a kid with your spouse. What’s better for your marriage than some good ol’ laughter? Break out the water guns and water balloons and let each other have it. What’s on your summer bucket list? Let me know in the comments!